For most of you, it’s probably your first time living away from home and for some of you, it’s probably your first time fending for food on your own. While Gordon’s and ramen will be sufficient enough to cure your hunger for the first few weeks, don’t let yourself succumb to that restricted menu for the remainder of the year. Life, college especially, is full of challenging inquiries and obstacles, however, the easiest question I’ve ever had to answer is, “if you could only eat one meal for the rest of your life, what would it be?” Simple: prime rib, cooked medium rare, with a side of garlic mashed potatoes. 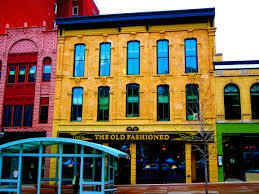 And as high maintenance and impossible as that sounds, there is one brilliant restaurant on the square whose Saturday Night Special just so happens to perfectly fit that description: The Old Fashioned. I know exactly what’s going through your head right now. You think it sounds divine, but there’s no way you can afford a nice, succulent prime rib meal on a college budget. Well, you’re happily mistaken. I’m here to let you in on a little secret—you can get a 12-ounce prime rib (half the weight of a basketball) for $28.95 OR you can order the petite cut which is eight-ounces (equivalent to the weight of a hamster) for $19.95. In all my dining experiences at the beautiful establishment, others call The Old Fashioned, I have always left with a happily satisfied tummy and leftovers that were just as good, if not better than they were the first time.